Low Level Laser Therapy is a technology that has been around for some 50 years, with over 5000 papers written on it. It is surprising the number of doctors who are still indifferent to the technology as it has been proven to be very effective in getting patients out of pain. Having practiced for 18 years myself, I have seen countless patients suffering with pain. No matter what reason they come in to see me, whether it’s an acute pain from an accident, a sports injury, a weekend warrior who fell off his ladder trying to fix his house, and especially long term-pain patients who have been suffering chronic pain for years. To get out of pain quickly and effectively, without taking pills, injections or having to consider surgery. I’ve seen it in my own practice, where patients are coming in saying that they’re tired of taking pills, they’re tired of the side effects and they want to fix the problem. No matter what the issue, whether low back pain, shoulder pain, neck pain or carpal tunnel syndrome, they are coming in for one reason. For their pain problem to be resolved. This is why it is vital for doctors to be more cutting edge and embrace new technologies and treatments, utilizing something different from the norm. Low Level Laser Therapy along with pain free Cold Laser Protocols is that treatment. Give the gift of a pain free life utilizing Cold Laser Protocols. Low Level Laser Therapy is a laser that, while not powerful enough to cut through steel, is powerful enough to affect the area of pain a patient is suffering. However, this on its own is not enough, it requires specific settings to be applied and administered for the therapy to be effective. While most manufacturers supplying LLLT equipment do provide generic instructions, they are not specific enough for most doctors and thus have only a minimal success rate, (a minimal success rate compared to what they can achieve with proper protocols in place). Many doctors therefore tend to give up with the treatment, consigning the equipment to the scrap heap. Others do not even bother investing in the technology in the first place. However, with Cold Laser Protocols, that technology can be resurrected from the scrap heap. For the first time, protocols that are applicable to any cold laser equipment are available. Through years of practice and development, we have put together many protocols which are housed in a specially designed software base that even your back room staff can follow and apply. 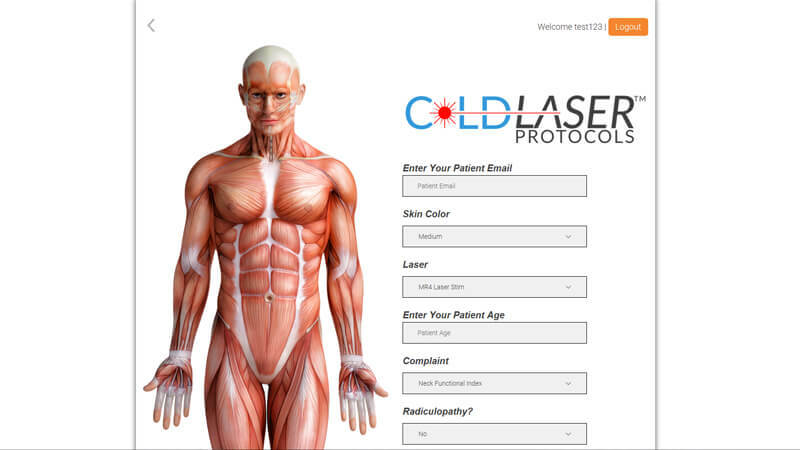 Once you have seen your patient, determined the condition, pain levels, and level of degeneration your patient is suffering from, you can input this data into the Cold Laser Protocols software. From there, a specific treatment plan will be calculated and at this point you can hand over to your back room staff. The software will not only provide the appropriate settings for the treatment, but also prompt with images, videos for set up and things to discuss with the patient. As a doctor, I have found these protocols invaluable to my practice. They have not only helped increase my patient satisfaction levels, but also my number of referrals. My Google reviews are all 5 star and growing all the time, and of course, this affects my revenue. I have effectively become the pain free doctor for my region. Our pain free Cold Laser Protocols used in conjunction with Low Level Laser Therapy have helped transform my practice and change the way I treat my patients. It has become one of the big three services I specialize in, and this has been essential due to the changing impacts of health insurance over the past few years. The bottom line is people want to get out of pain, effectively, efficiently, and affordably. Pain free cold laser protocol with cold laser equipment provides that, and gets the results both we, the doctors want, and exactly what the patients want. So give the gift of a pain free life to your patients. This is why Cold Laser Protocols was created. Do you want to be known as the pain free doctor in your community? Sign up below to find out more. We only allow our protocols to be used by one doctor within a geographic location. Be that doctor.